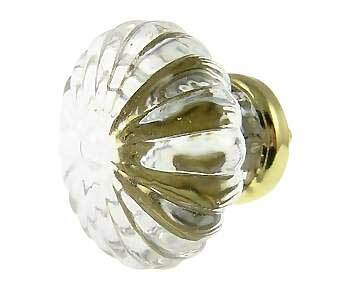 These large swirl pattern crystal clear glass knobs bring warmth and light into any room. Available in both Polished Brass and Polished Chrome finishes. These are perfect for the Victorian style home and also make excellent design accents to contemporary stainless steel appliances or granite countertops. These clear glass knobs are perfect for kitchen cabinet door knobs, furniture drawers, bathroom vanities, dressers, and restoration of vintage furniture. Both beautiful and durable, these imported glass cabinet knobs are made from the finest silica glass and were individually hand made by professional glassworkers. These glass drawer knobs measure 1 3/4 inches (44.5 mm) in diameter and have a projection of 1 1/4 inches (32 mm). These glass cabinet knobs are sold individually and they come complete with the hardware.